Why Do Fly Fishing Magazine Covers Always Look the Same? Question: With so much amazing fly-fishing photography out there (just look at the collections on this and other Web sites ), why do the covers of the big magazines always look the same? You can pretty much count on seeing some smiling dude with a big fish, especially on the cover of Fly Fisherman, but on the others, too. Answer: Magazine cover shots are the subject of much debate on both sides of the publishing equation. Editors and circulation managers agonize over each image, trying to guess which one will sell the most magazines. And make no mistake—the cover image on any magazine serves a single purpose: to make someone pick up the magazine off the newsstand. If you go to a Borders or Barnes & Noble to check out the magazine rack, you’re confronted with a stunning array of choices—magazines for all interests, hobbies, perspectives, etc. It’s a blur of logos and images and typography. How can one magazine stand out from the rest and demand your attention? By catching your eye as you scan the sea of covers. Once you pick up the magazine off the rack, the cover’s job is done. Now it’s time for the cover lines and table of contents to go to work, to try to convince you not to put the magazine back but instead to take it to the cash register. Never forget that magazines are businesses, and the more people they can get to buy each issue, the more revenue they generate. 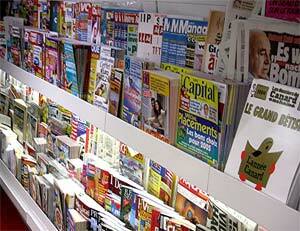 The newsstand is also the least expensive way for a magazine to develop new subscribers. When someone buys a magazine off the newsstand and then decides to become a subscriber, the publishing company wins. More subscribers means that the magazine can charge more for advertising, too. Of course, a magazine’s subscribers have already paid for the magazine, so the cover doesn’t have to impress them. If the content is good enough, a subscriber isn’t really going to grumble too much about what’s on the front of it. I’ve never heard of anyone canceling a subscription because they thought the covers were boring. Margins for error in publishing are very small, especially in tough economic times. One poor-performing cover can really hurt the bottom line, so publishers are loath to take big chances on unusual cover images, even if the image is particularly gorgeous. If you know that a well-executed grip-and-grin photo can reliably return a 35-40 percent sell-through, do you really want to risk an artsy casting shot tanking on the newsstand? In good times, you can take a chance on something “out there” —Fly Rod & Reel has traditionally been the most willing of the “big three” to experiment, and Fly Fisherman the most conservative—but lean times tend to make publishers and editors feel less likely to roll the dice. What an editor looks for in a cover image is something that really “pops,” where the colors and the contrast and the figures really stand out when you look at a cover from across the room. The grip-and-grin works well because the figure is usually large in the frame, he is silhouetted against the sky or a dark background, and he’s holding a beautiful fish. All fly fishermen are attracted to gorgeous fish, right? Plus, the standard framing allows lots of space for cover lines. So there are plenty of good reasons why such images predominate. Every editor I know would love to choose more interesting, dynamic, and varied covers for their publications. But there’s always a bottom line, and your magazine’s cover must be able to attract even the casual browser, who may not even be looking for a fly-fishing magazine. Making someone grab for your magazine instead of Cat Fancy can make all the difference.